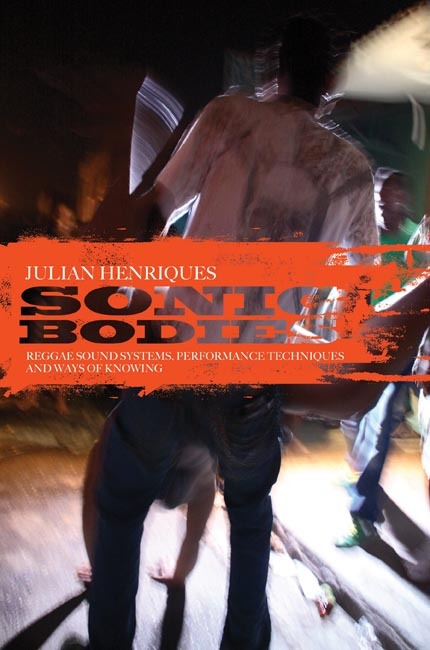 Sonic Bodies: Reggae Sound Systems, Performance Techniques, and Ways of Knowing published in the US back in September, and is due for UK release in early-mid November. It occurred to me that we haven't posted an excerpt from the book on the blog yet, so allow me to rectify that right now. The book is a groundbreaking and in-depth study of the cultures that spring up around sound systems, investigating the auditory, corporeal, and sociocultural implications of this particular brand of "sonic dominance." The book is illustrated throughout, and I've included a selection below. The excerpt follows the illustrations. Enjoy! Jamaican sonic culture has a particular affinity with the auditory values of sound itself, as well as with speech and music. It is of course the audio engineers who are responsible for production of the bass-heavy signature of the sound system – deserving as much credit for the sound of Jamaican music as their better-known music producer cousins such as King Tubby or Lee “Scratch” Perry, who invented dub music in the recording studio. The special value of sound in the popular culture of Jamaica comes to the fore in many different ways, some of which have already been made evident whilst others will be elaborated upon in the chapters that follow. One of them is the sheer size and music power of the sound system equipment, with several speaker stacks the size of a double-decker bus around the open-air dance-floor, delivering up to 20,000 watts of music power that can be decisive in a competitive “clash” between sound systems. Another indication of the value of sound is the secrecy surrounding the audio-engineers’ work, leading them to wire the electronics of their sets in cables of a single colour, rather than the usual colour coding – to prevent industrial espionage by rival sound systems. The effort and inventiveness that has gone into the development of the sound system equipment is also indicative of this value, such as the five-way music signal split from treble to sub-bass, with amplifiers dedicated to each frequency on each channel, as was reproduced in the Grateful Dead’s “Wall of Sound” stage sound system. This, along with other aspects of the fine-grain detail of the expert embodied knowledge and connoisseurship of the engineers, gives them an extensive sonic vocabulary, and can cause them to spend several days working to fine-tune equipment after a repair (as described in Chapter Three). There are a least two key characteristics of Jamaican auditory culture, one sonic and the other social. On the auditory frequency spectrum, Jamaican auditory culture is a bass culture. It is the high volumes, low frequencies – rather than mid or top – and distinctive rhythmic patterning that make Reggae’s auditory vibrations memorable, quickly becoming culturally laden, or “fully loaded,” as would be said. On the Dancehall scene the term “massive” is used for the crowd and their intensive, immersive, visceral experience of sonic dominance. These powerful low frequencies resonate with embodied movement and furthermore bleed into the cultural spectrum to become a carrier frequency, as it were, for Africa’s musical gifts to its diaspora. There are patternings, entrainments and syncopations between these auditory vibrations and the breaths, pulses and heartbeats of the crowd’s corporeal vibrations. This makes a phonetic connection – where none exists etymologically – between bass frequency and base matter, as the corporeal embodiment of the crowd. The bass culture of the sound system may be contrasted with what Marshall (2010) calls the “treble culture” of earphone listening. Both bass and treble cultures are tailored to and by their particular phonographic technology, each inevitably favouring particular aesthetic forms. The mode and manner of listening is also distinct, with the shared socialité of the sound system delivering the bodies into sound with, by contrast, the isolated privacy of mobile devices delivering sound into bodies. As well as bodily being, heartbeat and blood pulse, this idea of base extends further – into the body politic. The base is the means of production on which Marxist materialist philosophy is founded – as well as society’s ideological superstructure. Indeed, the sound system sub-culture has itself been described as a “cultural apparatus,” with “its own aesthetics and a unique mode of consumption,”34 escaping and even reversing the dominant political ideologies of racism of society. Reggae music forges such resistance out of the intensities and dynamics of the material vibrations of sound itself at about the same historical moment of the 1960s and early 1970s as it was being rendered verbally as “black power,” drawing on a political history that began with Marcus Garvey in Jamaica in the 1920s. This is bass and base as the bottom line of sound, upon which the “vibes” bass culture has been “built,” to use the studio producer’s phrase. This idea of the special resonance that bass has for the substance of sound was also picked up by the American novelist Ralph Ellison (1947), as Alexander Weheliye (2005) discusses. In The Invisible Man Ellison provides an early iteration of the idea of a bass culture where he discusses the special significance of “the lower frequencies” for his hero’s sense of identity.35 The Invisible Man pumps his cellar not only with light, but also with sound, delivered by five radiograms simultaneously playing Louis Armstrong. The record playing on the turntable? Famously, it was (Why Do I Always Feel So) Black and Blue, recorded in 1929. A further resonance between bass and base is suggested by the gendering of the sound system. Though this is certainly enjoyed by women, it is produced entirely by men. In patriarchal societies, the gendered voicing of sound associates bass with male and the positive values of strength and authority, with conversely the higher pitched woman’s voice being associated with hysteria and other psychological disorders, as Carson (1995) explores with reference to ancient Greek society. It is also interesting to note the contrast this bass inflection provides with current trends in metropolitan listening habits. Here the technological limitations of the iPod – a similarly phonographic apparatus – severely compress the dynamic range of amplitudes and drastically cut the bass frequencies. There is indeed a pronounced contrast between on the one hand the shared social experience of music in which the whole body is immersed, as in the dancehall session, and solipsist in-ear listening on the other. This idea of bass culture has also been accompanied with that of “low end” theory as a marketing theme on the current London Dubstep scene, with Burial’s second album Untrue.39 The distinctive sound of Burial’s music tracks explores the textures and colours of sound to achieve a particular late-night, after-the-club, urban feel, developing the distinctive London sounds of the 1990s Jungle and Drum & Bass, and more recently Grime. Dubstep, along with many forms of electronic music, is also inspired by Dub. This musical genre was invented in the late 1960s and early 1970s by the sound engineers such as King Tubby, Lee “Scratch” Perry and others in Kingston recording studios and the dancehalls. Their techniques exploited recording and phonographic technologies to excavate the textures, timbres and resonating depths of sound itself. To dub is to copy, underlining what can be described as the actual grain of sound, as Barthes (1977) famously discusses with “the grain of the voice” at the limits of language.41 Similarly at the limits of music, the particular tone and tenor characteristic of the Jamaican sound provide cues for thinking through the vibrations of the material waveband of sounding. These are without recourse to ideas about authenticities, origins or essentials, or referring to the structural features of melodies, harmonies or even rhythms, or attempting any musical homology with social and political structures. Instead these vibrations give attention to the ebb, flow and flux of sound waves themselves. On the social spectrum, Dancehall is also a base culture; it comes from the street, indeed the often unpaved ghetto street. It is a subaltern popular form of expression. This is one of the reasons why the Jamaican sound system scene makes a compelling object for investigation – at a contrasting extreme of the social spectrum to the experimental vanguard of European classical avant-garde traditions to which most musicological attention is given, such as, for example, IRCAM (Born 1995). In fact, experiments in the use of sound to make music were made in the 1970s in Lee “Scratch” Perry’s Black Arc studio in Kingston, for instance, that were similar to those going on in Paris with Gerard Grisey’s “spectral” compositions. Indeed the Dancehall scene is bursting with an inventiveness and creativity to which this research project aspires. Every night of the week and every week of the year, the maintenance crews set up their huge stacks of speakers and massively powerful amplifiers and large live video projection screens. These sessions are attended by crowds of hundreds and flourish amidst the poverty, hardship and violent gang warfare of inner-city Kingston where they began over 50 years ago. Jamaican sound systems have proved themselves to be amongst the most resilient of social and cultural institutions. For many from poor backgrounds the sound system scene provides a livelihood; for others it is a way of life; and for many more it is a source of consumer-led style, fashion and entertainment. In terms of economic importance, identification and numbers, the only comparison to the sound systems would be the local football teams or the Jamaican churches. The sound system scene is also of research interest as a base culture, as distinct from a culture of the superstructure, which is presumably what fuels Jamaican middle-class criticism. Dancehall is undoubtedly a creation of the street. It is working-class – vulgar, subaltern and lumpen, given the levels of unemployment – and marginal, given its involvement in the black or grey economies and criminal activities, as for example with “The British Link-up Crew” (Hope 2004). It is the creature of those in Jamaica called the sufferahs (as lyrically expressed in Bounty Killer’s 2003 hit of that title). The values are those of materialism, conspicuous consumption and “bling,” readily imported from the USA, only an hour’s plane ride away in Miami, or the multitude of American satellite channels whose footprint falls on Jamaica. Urban geography reflects what has long been acknowledged to be a society sharply divided along colour and class lines. In terms of local entertainment, as well as everything else, the poor downtown Kingston areas and other ghetto communities consider themselves to be largely isolated and excluded from mainstream civil society. Formerly middle-class and prosperous areas, these downtown inner-city locations in West Kingston might now be likened to favelas or shantytowns in other parts of the world. For decades they have had only minimal access to economic and educational opportunities and a marginal position in relation to government agencies and the institutions of the Jamaican State, principally the police. The prevalence of poverty and violence has, however, encouraged an alternative unofficial political patronage system to establish itself in which local-area Dons provide resources, authority and protection for their communities, known as “garrisons.” Inner-city schools and churches often constitute the only local institutions whose representatives the local media can call upon for comment on local issues. In this respect, sound systems operate at the margins between their own world downtown and that of the mainstream. As all cult groups are strongly condemned by the upper and middle classes it is probable than many individuals are reluctant to admit their connection with Pocomania. The attendance at “meeting houses” in Portland suggests a substantial support from the lower class … Pocomania is essentially a proletarian movement. Trained at Oxford by the leading post-war social anthropologists Radcliffe Brown and Meyer Fortes, Henriques’ work initiated an interest in Jamaican popular culture that I would like to consider my own research as developing. It certainly encouraged the development of Stuart Hall’s Cultural Studies approach in the UK. Continuing with the social side of Jamaican auditory culture, to describe the sensibilities of Dancehall as a base culture draws attention to their grounding, as expressed literally through Dancehall choreography and its African-inspired folk traditions. Its baseness is the ground of the earth, soil, dirt or “dutty,” as is it called in the lingo. With flat-footed stomps and stamps the dancers emphasise their earthly connection, as a distinct contrast to the pirouettes and leaps of the European classical tradition that aspire to have as little contact with the ground for as long as possible. Furthermore, the dancing is literally bottom-up, with its signature sexually explicit choreography, “bumper-grinding.” Here the bass note is struck by the body itself – celebrating its own fecundity. Such an aesthetic continues to scandalize Jamaican middle-class opinion. For the middle classes, “base” denotes crude, unrefined, vulgar and even animal. Dancehall is therefore criticised in the register of sexuality as “slackness,”56 and the dancehall session is condemned as the source of this corruption. Such basic lower frequencies and embodied resonances are considered as distinctly inferior to the higher notes that only the mind and not the body is considered capable of perceiving – with the refined sophistication of “high” culture. So what radiates from a session is not only the material vibrations of sound itself, and the corporeal vibrations of a new “riddim” or dance step, but also the word of mouth on the next session, not to mention all the gossip about who was there, with whom, what they were wearing and generally “what-a-go-on.” All this, as well as the cable TV broadcasts, DVD videos and compilation CDs, serves as a medium for the expression of the style, fashion and values of the Dancehall scene. Very nice, thanks for sharing this excerpt. Now can you PLEASE offer a 33 1/3 book on a classic reggae LP?? The obvious one would be the soundtrack for The Harder They Come (putting aside all of Marley's work), but there are so many worthy candidates- Lee "Scratch" Perry's masterpieces; The Heart of the Congos, Junior Murvin's Police & Thieves, and Max Romeo's War Inna Babylon, or how about the development of dub via Augustus Pablo's King Tubby Meets Rockers Uptown, any of Black Uhuru's classic Sly & Robbie LPs, Bunny Wailer's Blackheart Man... the list goes on and on. For authors, there's David Katz, Roger Steffens, Marc Griffiths, and plenty more... Just saying.